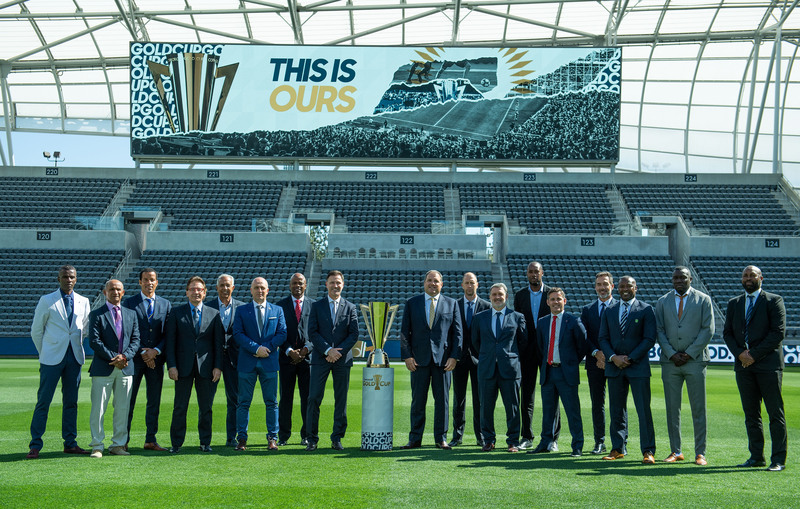 April 11 – The tag line is ‘This is Ours’ and yesterday in Los Angeles the full detail of how the expanded Concacaf Gold Cup is being shared across the US and for the first time into Jamaica and Costa Rica was unveiled. This summer the Gold Cup moves from a 12 to 16-team format for the first time, expanding the number of games that will be played and the cities that it will be played in. It also expands the competitive playing opportunity for Concacaf’s national associations. It is a move that has been embraced by the countries across the region and will for the first time see the MLS stop play for the duration of the regional championship. “This is our flagship competition,” Concacaf president Victor Montagliani told Insideworldfootball at the Concacaf Congress in Las Vegas two weeks ago. “There were concerns expressed about quality (of competition) but I don’t have them, this is part of football. I don’t expect the smaller nations to beat the bigger ones but we have seen results like Curacao only losing 2-1 to Mexico. The 15th edition of the Gold Cup, as well as travelling outside the US for the first time, will see an expansion to 17 stadiums used, up from 14 in 2017, eight of which are in contention to become a 2026 FIFA World Cup venue. The tournament begins with a double header on June 15 at the Rose Bowl in Pasadena, with Canada and Martinique marking the start of Group A action, followed by seven-time Gold Cup champions Mexico playing Cuba. The final will be played July 7 at Chicago’s Soldier Field. As part of the event at the Banc of California Stadium, the home of MLS side LAFC in Los Angeles, Concacaf showcased its NextPlay grassroots development initiative which uses the game to create safe spaces in member association local communities, while at the same time promoting social values. It is another part of Concacaf’s expanding footprint under Montagliani’s leadership. While the venues and match-ups were being unveiled, and somewhat in the spirit of celebration of the competition, Concacaf also announced Camarena Tequila as the official tequila of the 2019 Concacaf Gold Cup. Camarena Tequila will activate its sponsorship in select Concacaf Gold Cup markets, and will create and distribute co-branded items at retail and in bars and restaurants. Camarena joins Allstate Insurance Company, Cerveza Modelo, Nike, Scotiabank, Sprint and Toyota as official sponsors of the 2019 Concacaf Gold Cup.